From Champoluc to Cervinia in the Aosta as we do it Italian style. Food, sun, skiing and more great food. Cervinia is one a more modern resort of the Aosta Valley. It has the longest season between November and May, then with glacier skiing during summer months. It's also pretty high, the village sitting just above 2,000m and the skiing going up to 3,480m (3,890m from the Kleine Matterhorn which Switzerland has claimed). Cervinia is connected to Switzerland's Zermatt, one of the world's most reputed ski resorts, and the novelty of skiing cross-border will never wear off. Most of the resorts of Aosta have French names: Courmayeur, La Thuile, Champoluc, Crévacol. Aosta used to be Savoie way back. After the Second World War, Mussolini wanted names of new towns to celebrate their Italian-ness, and so, Breuil born, Cervinia was renamed, after Monte Cervino (aka the Matterhorn) towering over it. It borders Switzerland and shares the Matterhorn - or Monte Cervino, so its corners really are Swiss and French. I drove round from Champoluc by car, where I'd spent my first 24 hours in the Aosta Valley. Runs are mostly easy reds - carve skiers and snowboarders eat your heart out. Even better, there's a 20km run you can do from the Kleine Matterhorn all the way down to Cervinia's lower neighbour, Valtournenche, descending 2,300m. The views are out of this world, the Italian white peaks stretching on and on, the main reason why this region is my #1. In fact, with less impressive numbers, but even better of a ski is red #7 from top to bottom in Cervinia. Ventina is its name and it rolls down into Cervinia. Take it last, at the end of the day, finishing at apres on the low slopes. Each time I've done it the colours of the sky have been pastel. You get a hell of a view of the Matterhorn, Italian side, which is the most dramatic viewpoint from this side, where it actually looks as big and imposing as it actually is. (The Matterhorn looks like a very different mountain depending what side of the Swiss-Italian border you are). More advanced skiers might want to buy the Cervinia-Zermatt pass, to open up the huge amount of terrain available on both the Swiss and Italian side. Dropping into Zermatt, you'll reach the Schwartzsee area first, but a quick combo of lifts will get you to the Sunnega area, which is fun for a day trip, to get you back over to Italy again for the right time again: eating and drinking. Freeriding to Champoluc is also possible for those wanting to push boundaries further - there's actually a long held plan to connect the two Aosta resorts, so this linking valley must be worth exploring on skis. The Aosta has fast become a recognised freeriding spot. There's no heliskiing in France so adventurers often come to Aosta to do it. There were more than a few helicopters flying around the peaks on sunny days, no doubt some on heliskiing operations with the many unaccessed faces and couloirs to drop into. The beginner slopes in Cervinia are attractive with sunny, soft blues to build up confidence and snow time. 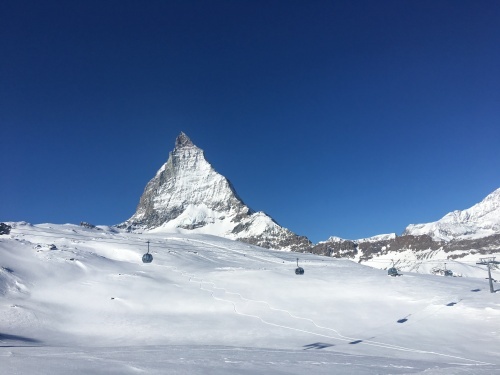 The glacier is accessed from Switzerland, and has great skiing back down to Cervinia, skiable to any of level of skier and snowboarder up already on the mountain with a cruisey ride home again. South towards Turin, back over Zermatt, across to the Matterhorn and sitting under the 4,146m monster, the Breithorn. There were climbers about to summit to Breithorn during my visit, surely about to ride down the serene mellow curve onto the glacier to join the pistes with fellow skiers. It's considered one of the easiest 4,000m mountain ascents and looks a beautiful ski, if only for the views and that extra earned 250m gain. Get up and out early - the only drawback to Cervinia is you have to take a few lifts before you can get in a decent run. What makes this ski trip the ultimate Italain one? The eating and drinking of course. I mentioned above you should save this for Italy, if you do cruise over to Zermatt for the skiing. Food is excellent in Cervinia, not to mention a fraction of the Swiss price. Our guide mentioned that eating on the mountain is better than off, and having spent time in many of the restaurants down in town on a snowy few days, this says a lot. Chalet Etoile for a ski lunch is one of the best in the Alps, if not anywhere. Polenta (I'm pleased to say) features most everywhere, a traditional warming aspect of this mountain region in Italy. Topped with rabbit ragu, veal stew, or swapped out with homemade tagliatelle is mountain food at its absolute best. Bontadini looks like your average self service restaurant when you clop in, but head downstairs to be seated and handed a menu, and again your on mountain food standards will thereafter soar. Local cured meats and cheeses begin each meal, and they by no means get old after a week. Long mornings, long lunches and a cruise home after a limoncello or Genepi. Hands down the best mountain food I've had, with incredibly high standards, low pretension and affordable. I'll say to anyone that likes sun, skiing and food to come to the Aosta Valley. Moving around resorts is possible and great fun to explore, but if you're feeling more like a chilled (Italian-style) holiday placing yourself somewhere and skiing the journeys is also the way to do it.